We have this big bin filled with toy cars that my son and daughter love to collect but which are just sitting around gathering dust because the kids never seem to play with them. So on a recent weekend when it was too cold to go outside and play, I pulled out the bin of cars and said no TV or video games today. My kids whined to me that was too boring but I had an answer for them by pulling out some InRoad Toys PlayTape. 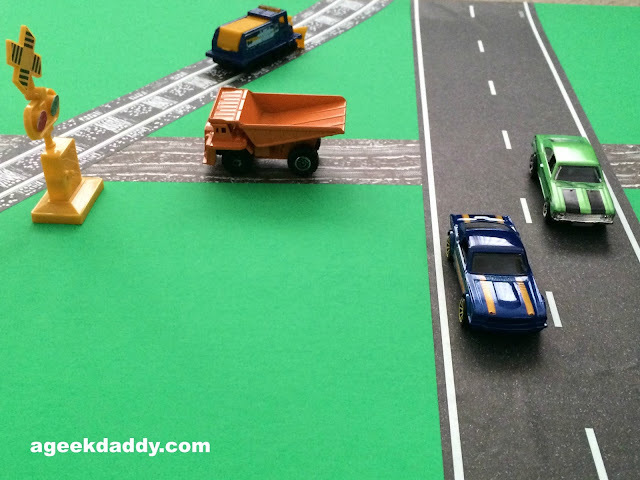 This product encourages children to engage in imaginative play by allowing them to create their own roads and rails to use with toy vehicles. I handed over the PlayTape to my kids and let them construct their own race courses, winding roads, and railroad tracks to entertain themselves with. They had a blast laying out designs with this special tape on our dining room floor and spent a few hours playing with miniature toy cars and trains that hadn't been given much attention in a long time up until then. The PlayTape stuck really well to our hardwood floor but more importantly when the kids were all done it also easily lifted up leaving no sticky residue at all. The last thing you want is your nice floors left with marks or gunk on them and with this fun product you can be rest assured that won't be a problem. Another nice aspect of InRoad Toys PlayTape is that when your kids have wrapped up playing with it you can throw it in the recycle bin rather than the trash can because it is recyclable. We had four rolls of PlayTape for my kids to be creative with which included 2 sizes of paved roadway, a dirt trail, and railroad tracks. 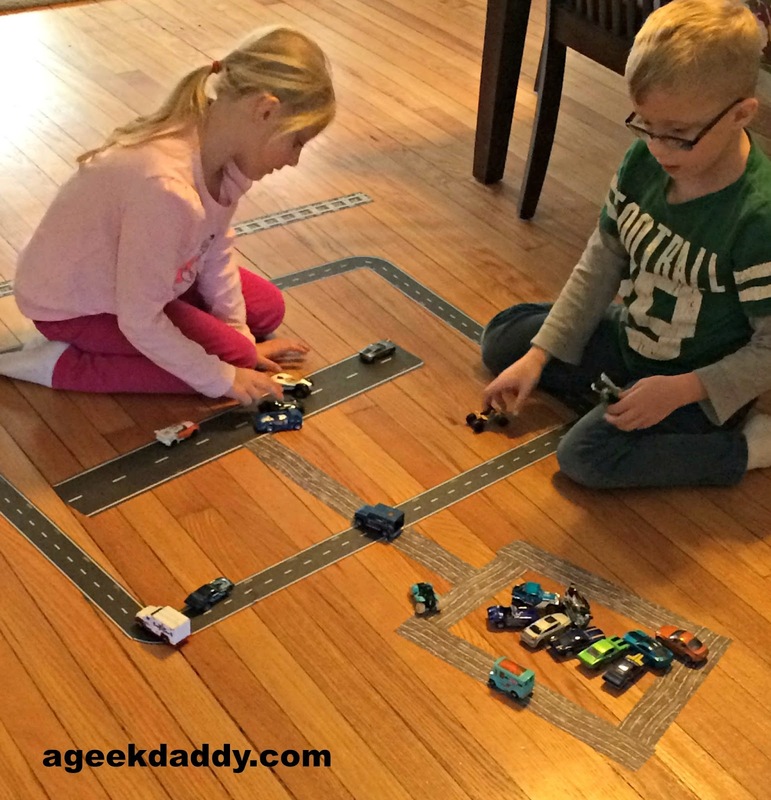 My kids then laid out a rectangular race track. Of course every race track needs an airplane runway so they added that in the middle. When their cars weren't racing they needed someplace to park so they added a dirt parking lot to the mix as well with the dirt trail themed PlayTape. I appreciated that my kids were easily able to tear apart the PlayTape to create the roads, tracks and trails they envisioned without my having to intervene to do it for them. It was also nice that they could usually re-position the PlayTape several times while playing without it losing its ability to adhere to the floor so they could switch things up a bit or not have to worry about laying down something exactly perfect the first time. This stuff will adhere to any flat surface including walls, which can make for some interesting scenarios, but while it is easy to remove from many surfaces mess free the PlayTape is sticky enough I wouldn't recommend placing it on carpet. 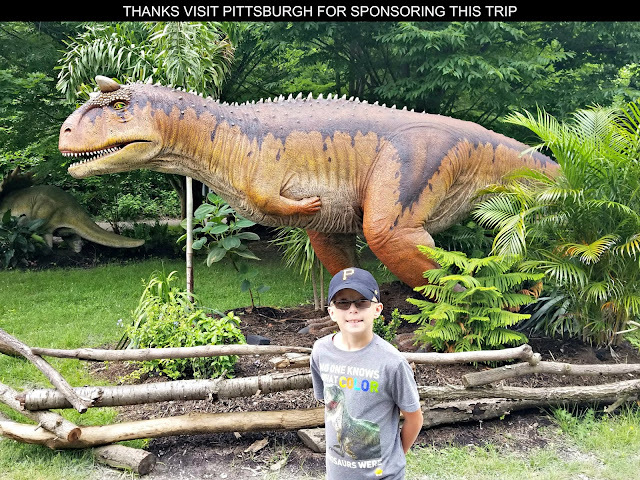 Looking for an idea to keep the kids entertained on a rainy day when traveling for a summer vacation or amused while your family is visiting relatives? Pickup a sheet of poster board and a few rolls of InRoad Toys PlayTape, which are both easily transportable, and take them and a few toy cars along with you. 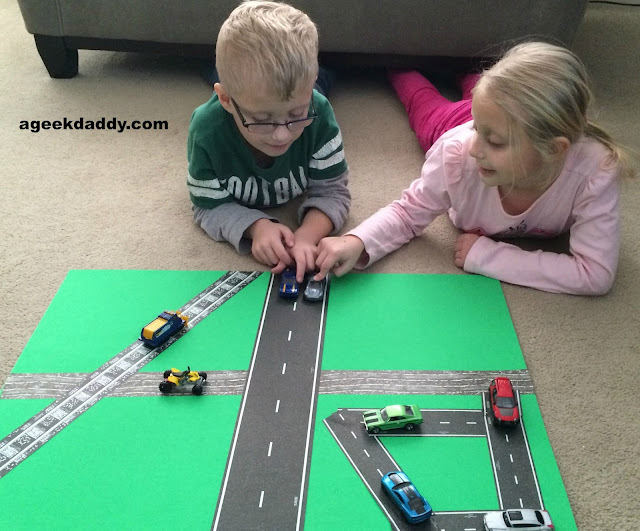 My kids built a drag racing strip, railroad crossing, parking lot, and a dirt road to play with their toys on a piece of poster board I picked up for them to use with InRoad Toys PlayTape. Note though unlike sticking it on a floor or wall, you aren't going to be able to pull off the PlayTape without ruining both it and the poster board. 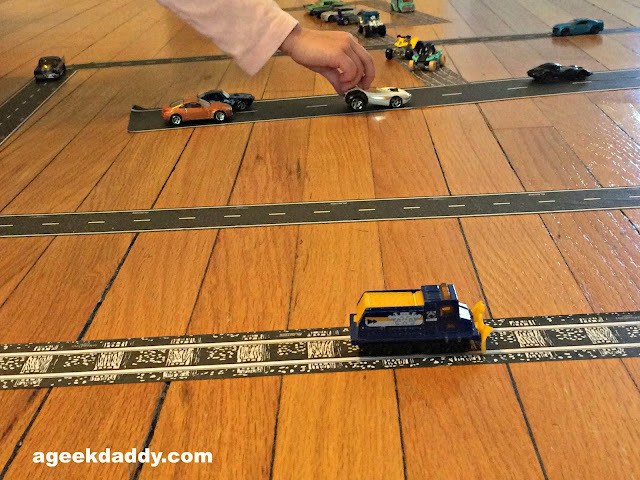 My 7 year old twins have enjoyed hours of fun racing their toy cars around the network of roads they've built with the PlayTape on several occasions. It really was great having them get some good use out of all the toy cars they've collected and seeing them being creative and imaginative while they played. When you tear off a strip of PlayTape from a roll it really is only good for one session of play. When the kids are done playing it is time for the material to be recycled rather than try to save it and use again. Fortunately there is enough material on each roll to be used for several play times. My kids have engineered themselves some pretty intricate road systems on several different afternoons with the original four rolls we were provided for this review. 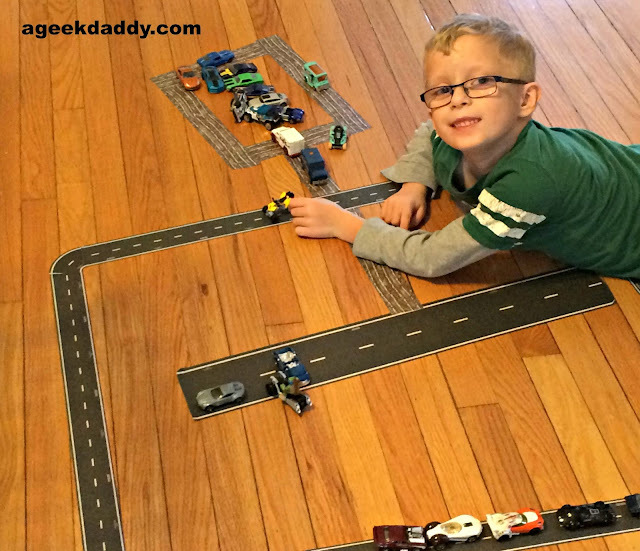 InRoad Toys PlayTape gets A Geek Daddy nod of approval because it is an affordable item made in the good ole USA that encourages kids to engage in creative and imaginative play without creating a mess or headache for mom or dad to have to address. Rolls of PlayTape range in price from $4.99 to $13.99 and the product has received quite a few awards and accolades. 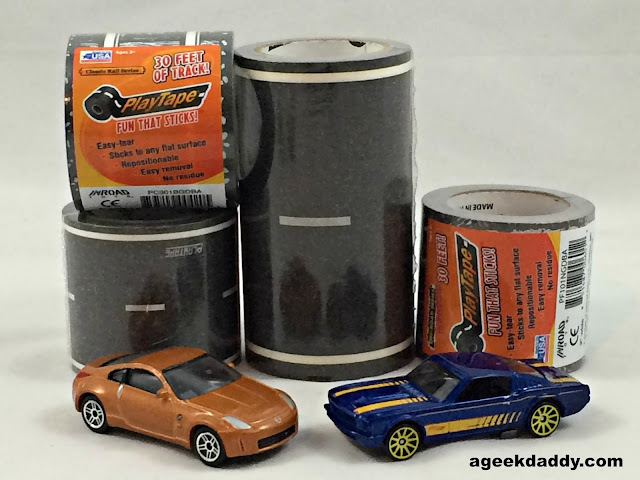 You can purchase InRoad Toys PlayTape online or you can pick up some rolls at a HOBBY LOBBY store near you. 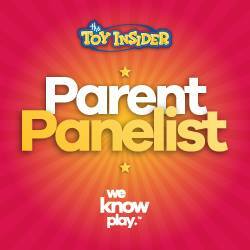 CLICK HERE to search for a local HOBBY LOBBY or another retailer that may be carrying InRoad Toys PlayTape near you. I have not seen this tape before, my kids would love it! VEry cool. My hubby would have a blast with this as would my son. Hey what a great idea....you can make your own highway!! Wow that is so cute! My boys would love this, perfect or our travels! Cars have always been a huge part of our lives - five kids - there are always plenty of cars around but not always plenty of tracks. This would take care of that for sure. What a fun product! My boys loved (and still have a bin filled with them) cars when they were little. They would have really liked something like to use with them! My son loved playing with toy cars when he was little. I love this playtape, he would have had so much fun with it. This would be great for the little ones. My guys would have loved this back in the day! This is so cool. My son would love it. Wish it worked on carpet as well. I really like how you can basically create your on roads; which will lead to endless fun. This would make a great gift for any child. This tape is fabulous! My son would have roads all over the house! this looks so awesome and a great addition to some key toys that kids play with. My son loved playing with toy cars when he was little. I love it! He would have loved it! Now that is way too cool. I would love to give this set as a gift. What a fantastic idea! My kids would have loved this when they were younger. Looks like yours are having a great time with it! What a cool product. I had never heard of or seen this product before, but wish I had this when my kids were younger! My girls would of love this when they were younger. Your twins are so cute. That is so cool! I can so see making all kinds of tracks for my son to play with his hot wheels. Ah you've got all that design talent too, so I bet it'd be a blast. My son was the king of matchbox sized cards for years. He'd have loved this track! Such a fun idea. I'd love to do this too! Now this would be cool for my day home! The little ones in my car love playing with the cars so this would be a great way to spice things up a bit. What fun! It is of course only worth it if it doesn't leave residue when you're done - so it seems like a win!